The Telugu Association of Greater Boston (TAGB) Ugadi - Srirama Navami celebrations were held at the Northborough Algonquin High School on April 14, 2018 and concluded with the participation of over a thousand members. Together, the TAGB members enjoyed a lot of fun activities for the audience to make the holiday atmosphere more exciting. The TAGB event venue was decorated beautifully by decorating the school entrance with traditional festive designs. Ugadi pacchadi and paankam which represent the Telugu tradition were served. Priyanka Vallepalli of Quality Matrix, Real Estate Agent Prasad Anem, and Desi Prime Realty Kiran Guandavarapu and others sponsored the event. Kiran Gundavarapu couple of Desi Prime Realty inaugurated the event by lighting the lamp. President Mrs. Manimala Chalupadi gave welcome speech. In addition to the spiritual songs of the children, chants, dance medleys, classical music and classical dance performances, Kalyan Kattamuri's "Kitakitalu" comedy was applauded by audience. Kumari Mahima Silappagari sang popular well-known folk songs. Shri Phani Dokka's Telugu Avadhanam impressed viewers. Ramana Duggaraju, Sreenivas Kaki and Padma Parakala felicitated avadhani Sri Phani Dokka on behalf of TAGB. Innovative programs by children and adults with enthusiasm have received special praise from the audience. TAGB honored Mrs. Madhavi Donepudi for her outstanding services in greater Boston area. 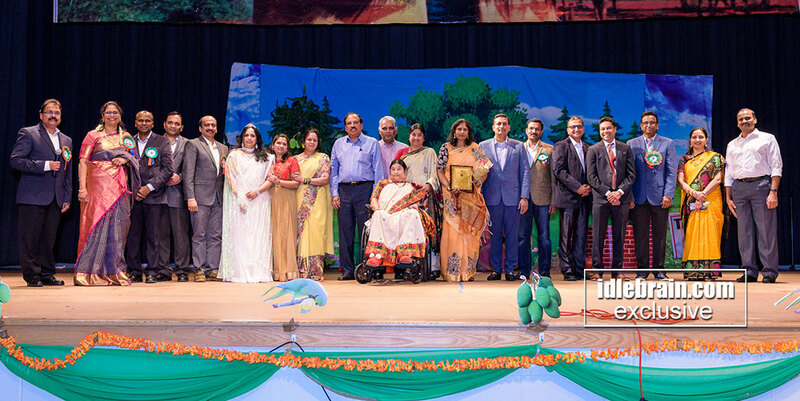 Dr. Haribabu Muddana, Babu Rao Polavarapu, Mrs. Sairani and Dr Ammani Dasari, Mohan Nannapaneni and Sasikant Vallepalli felicitated her with a shawl, and a plaque on behalf of TAGB. Padmaja Bala and Shri Srinivas Bala directed the devotional dance of Bhakta Prahlada under the banner of Balalahari. Mrs. Padmaja Bala, who gave such a good show, has been honored by the Sri Subbu Kota and Prakash Reddy on behalf of TAGB. Artistes captivated the audience with more than 45 programs for approximately 9 hours. The members of the team were supervised by Sri Seetharam Amaravadi, Sri Ramana Duggaraju, Mrs. Padmaja Bala, Sri Ramakrishna Penumarthi, Ms. Satya Parakala and Mrs. Deepti Gora. The programs have been successful, which means that many children, their parents, and teachers, as well as many volunteers and TAGB committee members are behind them for many hours of hard work. For those who have performed various arts, the winners of the poetry contest were recognized by the TAGB Committee. TAGB introduced a charity team first time with the plan of doing community service in greater Boston. On Wednesday, April 18th, TAGB will be doing community service in Lowell Soup Kitchen. Green team of TAGB, as a part of environmental awareness, introduced reusable cups and reduced the use of "plastic bottles" significantly. Minerva Restaurant provided a delicious dinner for the guests who attended the event. TAGB Chairman Sri Sasikant Vallepalli thanked everyone on behalf of BOT members. Members of the TAGB cultural community have been commentators for this event. Finally, TAGB Secretary Mr. Ramana Duggaraju thanked sponsors, performers, volunteers and audience. The celebrations ended successfully with the singing of the national anthem.